Sandy Young, a rancher and activist, died in August at the age of 64. Sandy Young may not have been a household name to everyone in Southwest Colorado, but her tireless public service has certainly been felt by anyone who enjoyed the wilderness and mountains. Young died after a short, intense battle with ovarian cancer Thursday, Aug. 16, 2018. She was 64 years old. Young ranched all over La Plata County since she arrived here after leaving her family’s farm in Wisconsin in 1980. Most recently, she worked in the Animas Valley, running cattle and her outfitting business, Seventy Seven Outfit. But she could just as often be found at any number of community boards she served on. 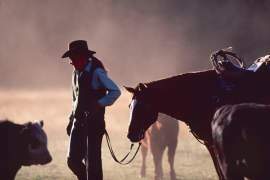 The list is too extensive to name them all, but to name a few, Young was treasurer of the La Plata/Archuleta Cattlemen’s Association, had a seat on the Habitat Partnership Program Committee for Colorado Parks and Wildlife and was a founding member of the Four Corners Back Country Horsemen. “She just really felt proud to be part of the community,” said her husband, Larry Zauberis. Young was born in Waukegan, Illinois, on June 12, 1954, to Donald and Clare Young. The family moved to Wisconsin in 1969. In her mid-20s, Young headed west, looking for a chance to work with horses. She found a job as a cook for an elk hunting camp in Hermosa. There, she met Zauberis. The two have been together since 1980, and officially married Oct. 28, 2010. Over the years, Young worked a variety of jobs. She worked at James Ranch, and rode the Dutch Creek grazing allotment with Zauberis in the early 1980s. She raised hay on the Dalton Ranch, before it was developed. And she managed Frazier Ranch. “She just fell in love with that country back there,” Zauberis said. Young was diagnosed June 11, 2018, with ovarian cancer after a routine doctor’s check-up. She had showed no signs of illness beforehand, her husband said. Despite treatment, her condition worsened, and she died a little more than two months later, at home surrounded by her friends and family. Linda Mannix, coordinator of the Durango Cowboy Poetry Gathering, said there will be a tribute to Young at this year’s event. Mannix said Young was a true “cowboy-girl,” with a passion for the mountains and riding horses, and a strong advocate. Barbara Jefferies, president of the La Plata County Cattlemen’s Association, said Young was an integral part of the association. What surprised people most in her public service, Zauberis said, is that Young could look at an issue from all sides. She was never set in her positions. “She was very pragmatic about things, and practical, and really thought about issues,” he said. A celebration of life will take place from noon to 4 p.m. Sunday, Sept. 23, 2018, at Junction Creek Group Pavilion in the San Juan National Forest.